On Wednesday, the NHLPA announced the names of the 40 prospects invited to the 2015 NHLPA Rookie Showcase. The only Blackhawks player invited was forward Ryan Hartman. Hartman, who will turn 21 on Sept. 20, will be in Toronto on Tuesday, Sept. 1 for photo ops and media availability. 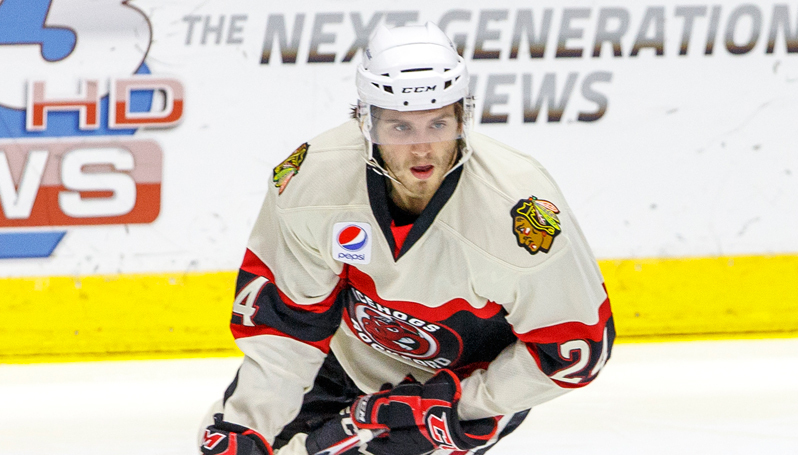 Chicago’s first round pick (30th overall) in 2013, Hartman posted 13 goals and 24 assists with 120 penalty minutes in his first full professional season with the IceHogs last season. He appeared in five NHL games with the Hawks last year. I’m no hockey savant, but I like this guy and think he’s a Blackhawks fourth-liner of the near future because of his controlled aggression. Got some vinegar in him. Yes, who can forget his first ever NHL shift when he plastered Devil’s Zubrus, who is 6′-5″, …and knocked his helmet clean off his pinhead. He took out Zidlicky as well just before or after that. That was electrifying. Apple cider vingear. Definitely the kind of player who will fit right into an Indian head sweater jersey. Reminds me a little of Shaw but with more grit, better hands and great vision of where to be on the ice. His time is now. @ Minning, probably the hit of the year for the Hawks. 1st shift and BAM! Hello! Not only is Hartman a “thumper” but the guy has a A+ shot. He’s got a heavy shot with a quick release. His hands are the most underrated part of his game. He will also be a nice replacement for Sharpie as best hair on the Blackhawks! Connor McDavid (Oilers), Jack Eichel (Sabres), Dylan Strome (Coyotes), Mitch Marner (Maple Leafs), Noah Hanifin (Hurricanes), Ivan Barbashev (Blues), Chris Bigras (Avalanche), Oliver Bjorkstrand (Blue Jackets), Madison Bowey (Capitals), Connor Brown (Maple Leafs), Michael Dal Colle (Islanders), Nikolaj Ehlers (Jets), Robby Fabbri (Blues), Zach Fucale (Canadiens), Nikolay Goldobin (Sharks), Ryan Hartman (Blackhawks), Connor Hellebuyck (Jets), Julius Honka (Stars), Kasperi Kapanen (Maple Leafs), Ronalds Kenins (Canucks), Slater Koekkoek (Lightning), Dylan Larkin (Red Wings), Sonny Milano (Blue Jackets), Samuel Morin (Flyers), Mike Matheson (Panthers), Michael McCarron (Canadiens), Josh Morrissey (Jets), Brendan Perlini (Coyotes), Nic Petan (Jets), Emile Poirier (Flames), Shane Prince (Senators), Ryan Pulock (Islanders), John Quenneville (Devils), Mike Reilly (Wild), Nick Ritchie (Ducks), Travis Sanheim (Flyers), Mackenzie Skapski (Rangers), Brady Skjei (Rangers), Shea Theodore (Ducks) and Jake Virtanen (Canucks). Thanks for the list there, I was actually wondering who else was on that list. SSHM, it appears that the better players are the ones listed at the beginning of the list. Would it be fair to assume that whoever created this list believes that Hartman is the 16th best rookie prospect listed? Two of the best players (besides Eichel/McD)- are Nick Ritchie and Dylan Larkin- imo… Ducks/Wings got two good ones there! Right you are! Wishful thinking on my part. Agree with ya Mining Man! Kid can play and be physical at the same time!! Think he would be a great addition for the Hawks!! Worthless Bickell should take some notes!!! I have seen some Internet traffic that that Hawks are trying to get Jeff Skinner from Carolina, any thoughts on the validity? Who would Carolina take back? Bickell and Versteegt? Carolina wants to shed, not take on. Perhaps the length of contract is the allure, but I’d be skeptical. Hawks net gain is less than 500k in space in that scenario. With Skinners injury history and production, Versteeg is a better player at less than half the price. Both Vegas and QC advanced to the 3rd and final round of expansion rreviewA decision will be made as soon as September. Looking ahead I have a question on a possible expansion draft scenario. Are NMC’and cap recapture penalties enforced in an expansion draft? Say the Hawks expose Hossa to and a team takes him. He could be alluring for a few different reasons. One cause hes Marian Hossa the other because of his contract. An expansion team probably wouldn’t care about recapture and it would help them get to the floor. Now if the Hawks would incur a recapture as well, you can just assume he’d go the LTIR route. But I’m curious how that might work. Technically it’s not a trade. I can’t see any scenario where the Hawks are interested in Skinner – too costly, too often injured and not an area of need. I wouldnt be against the pickup but the problem is the contract. Skinner is making 6 mil per for another 4 seasons. Honestly for those dollars I would have rather retained Saad. Thought some might be interested in a short interview with the new play by play voice of the Ice Hogs, Bob Mills. Announcer pipes for sure! Got it, you call have convinced me, Skinner should stay in Carolina! I would trade Bickell and Versteeg for Skinner. Salaries almost match. Throw in a decent prospect or draft pick and they might bite (lol). Fwiw, I would have preferred keeping Saad as well but that horse has left the barn. 2016/17: Bickell versus Skinner = Hawks take on additional $1.75M on Cap. 2017/18 and 2018/19: Skinner = Hawks take on additional $5.75M both years. The Hawks can not afford Skinner and with his injury history he’s a high risk investment that the Hawks shouldn’t take. True ER. But strange things could happen in a couple of years. 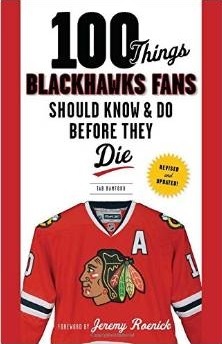 For example: Brent Seabrook moves on; Patrick Kane is pleasuring himself in Sing Sing; cap gets bigger, etc. IMO, he would look good playing with Toews and Hossa. If healthy, there is no reason he could not score 30+ goals. In any event, people should take a look at this. my issues w/ Skinner are his $5.75M cap hit and his concussion history. At 5-11 and 190 lbs, not sure the Hawks need to have that size of a cap hit in a lineup w/ Teravainen, Panarin and, in theory, Kane – while adding another big piece of cap to the already well established problem the Hawks have. Even trading Bickell & Versteeg for him doesn’t accomplish the Hawks’ real need right now – enough cap space to sign Kruger. That’s a 2-for-1 break even proposition that doesn’t necessarily improve the club. Sorry, but I haven’t been a fan of Skinner for a few years now and certainly don’t see a scenario where he makes the Blackhawks better without Carolina taking a lot of salary AND retaining a big chunk of Skinner’s contract. Panarin- is not that small- guy has some guns- which shows, he isn’t afraid of the weight room. Kane??? nobody knows for sure-where he might be in future. @ Kucherov and Hedmam were both very impressive in the SCF. I would love either guy on this team. Im not sure when the Hawks are going to be big players in fa market. This teams not really built to be adding contracts over 5 mil over multi years w the current cap situation. I was thinking the Kane might be in play for Sharps A but now no chance. Seabs or Hossa will likely be that guy now. If its Seabs expect a multi year deal to follow. I dont think they give him that A and let him skate outa town after the season ends. SSHM- scenario is only in play if Kane is not w/ Hawks… hope Kane is still a Hawk- cuz- 88 paired w/ 72 or 50 or TT in future would really be special…. If the Kane/case goes away quietly… I really believe the Hawks are better “O” side of the puck w/ additions AA/50/72/86 full year… still big ??? on the Team D side. And- Kane/issue-is a BIG IF!!! Don’t forget Palat when discussing lightning. Was stuck in moderation for a while there. Any thoughts on Vegas and QC and a possible expansion draft? And how an expansion draft would apply to NMC and recapture penalties. Timing might be a year too soon, but it would be a way for the Hawks to shed the Hossa contract if recapture isn’t an issue. The LTIR route works too, but the Hawks would still have to be under the cap prior to putting Hossa on LTIR to start the year and every year until the 2020/2021 season. After this year Hossa’s salary decreases while his cap hit remains the same. Salary of 4 million next year then 1 million the until the expiration of the contract. IIf the Hawks leave him unprotected he could be valuable to a team similar to the way Pronger and Savard are valuable to Arizona and Florida. Just a thought, what do you think? Wall, I’m pretty sure you meant #56 (Dano) to be paired with Kane and 72 or TT – not #50 (Crawford).